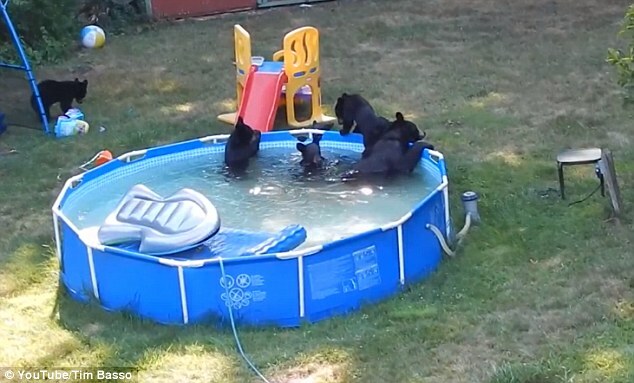 A stunned family captured hilarious footage of a family of bears cooling off in their paddling pool – before playing on the slide, chewing up the floats and absolutely trashing the garden. The humorous moment was filmed by the family, who watched the chaos unfold from the safety of their home in Rockaway, New Jersey. 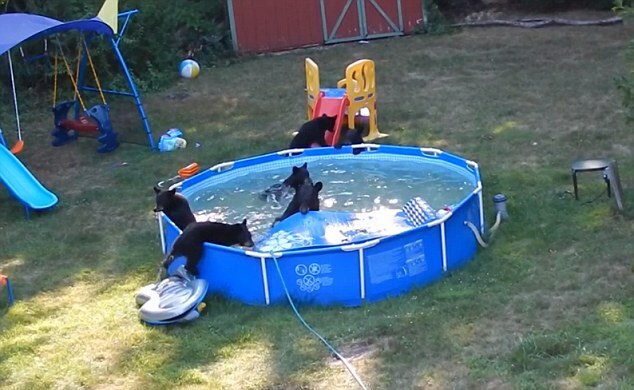 The video shows the young bears are quite relaxed at first – they bob around with only their heads above the water and appear to be content. 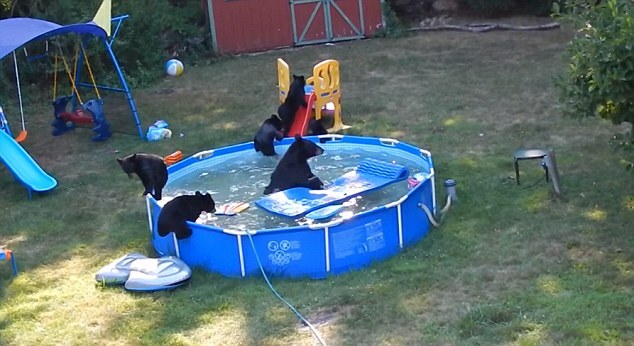 Later in the video the fluffy family become increasingly rowdy and began exploring the garden. 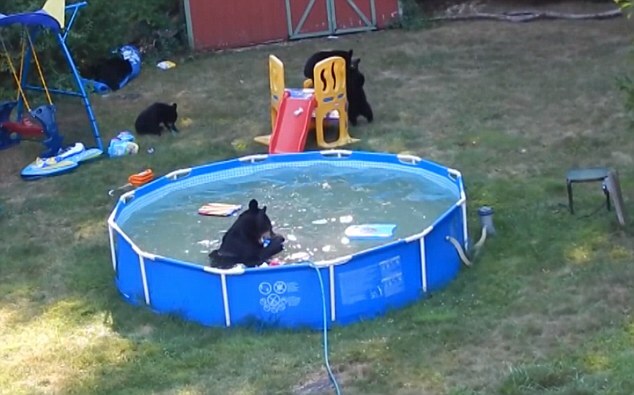 Humorously one of the youngsters watching announces 'there are bears in the pool' before saying 'they took my floatie'. 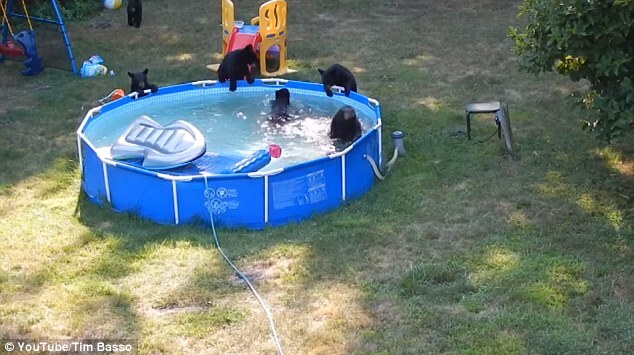 Later in the video the fluffy family become increasingly rowdy and the mother bear sets the example by throwing a float out of the pool. The young girl later responds by saying 'bad mummy bear'. One of the baby bears then heads off to the swing, another runs over to an inflatable ball and pops it almost instantly and a third pulls a float up the garden. 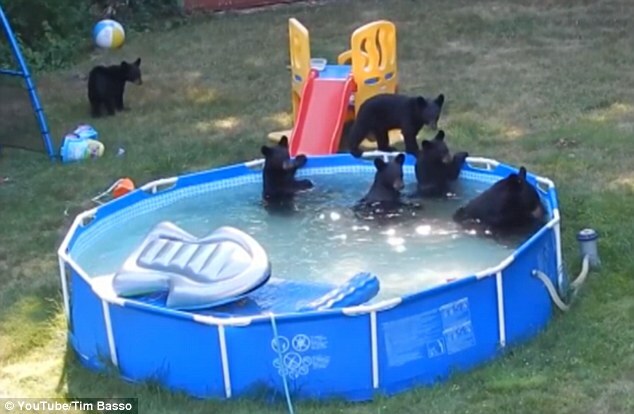 Responses to "Stunned Children Watch Family Of Bears Cool Off In Their Paddling Pool "
Nursing all those babies she needed to cool off. I know how hard just one is to nurse. Or maybe he has an appreciation for the money he coughed up for that pool and keeping it damage free so HIS kids can swim in it?